Магазин для СКС от американского производителя ТАРКО калибром 7.62 x 39mm, выполнен из высокопрочного композитного материала. Базовая накладка сделана из металла. Вмещает в себя 10 патронов. Внимание! Магазин сменный для СКС на 10 патронов Tapco также подходит для для ВПО-208 .366 TKM. TAPCO designed the SKS Detachable Magazines with serious shooters in mind. The mag body, made of high strength composite, has horizontal grooves cut into it for an enhanced gripping surface. TAPCO uses the highest quality interior components and incorporates a metal floorplate so you can expect maximum strength from this magazine. That, plus the fact that this mag is made in the U.S.A. so it counts for three compliance parts, you could say weve really thought of everything. Counts as 3 U.S. 922r Compliant Parts. 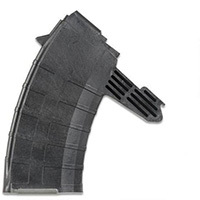 TAPCO SKSs magazines can be used in factory wooden stocks by modifying the inside of the magazine well on the wooden stock, removing material to accommodate the wider polymer magazine.